A Diamond is Forever... Love is Eternal. I presume, regardless of whether you've dreamed of this your whole life, it must be stunning to marvel over a stone resting on the flesh of your finger - forever - serving as a reminder, to you and everyone you meet, of the person specifically designed for you. Personally, the irony of a sacrificed salary sitting on my finger to symbolize the most priceless gift in my life makes me uncomfortable, but yet we can all marvel over precious stones. Uncovered rocks whose former old, dirty form developed an incredibly strong bond and became solid under immense pressure, whose beauty was revealed only after being found, carved, and fully exposed. 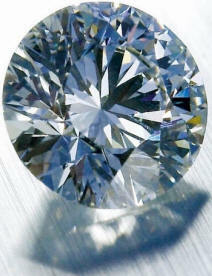 No matter what you do to it from there, it's a diamond, forever. How fascinating that someone long ago chose the diamond for marriage, which, like the relationship itself, is most beautiful when light is able to shine through it, the never-fading reminder, reflection, and celebration of union. I seek not so much the rock which lives forever, as the love which lives eternally.